Hi there! 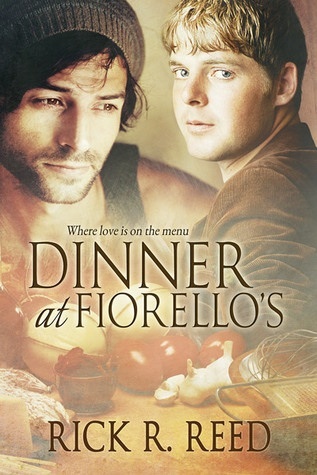 Today I’m sharing my love for Rick R. Reed’s contemporary M/M romance DINNER AT FIORELLO’S over on Joyfully Jay’s Book Reviews. This was an especially tender romance between a new-graduated high school boy, Henry, and an executive chef, Vito, who doesn’t want to fall in love. I had previously enjoyed Reed’s LEGALLY WED, and was anxious to read more of his work. I was just as charmed as before with his characters and the lush setting descriptions. As a native Chicagoan I could see my hometown in the pages, with startling clarity. I, too, sweated along with Henry on sultry walks and sweating ‘L’ rides. I’ve had his same sun-baked feet too exhausted to go forward. I haven’t had his sudden lack of home and family, but Henry never squawks. He’s determined to make his life his own, even when the convenience he’s had growing up is suddenly yanked away. You can find my full review on joyfully Jay.